What are the effects of inflation on an economy? What are the effects of inflation on an economy? Inflation can be defined as a sustained rise in general price levels. This is a very general definition as there are so many factors that have to be taken into account when considering the General price level of an entire economy. 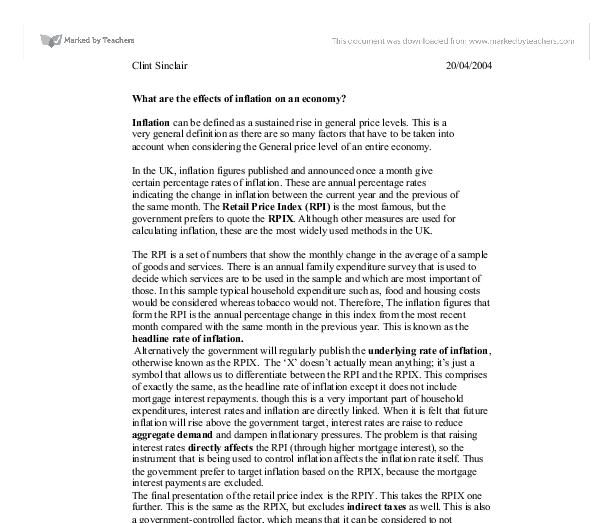 In the UK, inflation figures published and announced once a month give certain percentage rates of inflation. These are annual percentage rates indicating the change in inflation between the current year and the previous of the same month. The Retail Price Index (RPI) is the most famous, but the government prefers to quote the RPIX. Although other measures are used for calculating inflation, these are the most widely used methods in the UK. The RPI is a set of numbers that show the monthly change in the average of a sample of goods and services. There is an annual family expenditure survey that is used to decide which services are to be used in the sample and which are most important of those. In this sample typical household expenditure such as, food and housing costs would be considered whereas tobacco would not. ...read more. These values are then multiplied by their respective weights in the list. This value is then divided by the number of products on the list. This number is then converted into an index. All indexes have a base year, or a base month in this case, which is 100. Thus if the base year began in January 2000, and the RPI rose by 4% by February then the index will be 104. This change is plotted onto a graph, which will illustrate inflation rate of change. The costs of inflation With continuous changes in the interest rates, time is initially lost, as consumers will shop around for the cheapest possible price of products. There are also the continuous costs of changing packaging and price tags on products as prices change, thus increasing the price of products slightly. These however are the lesser of the problems that arise from fluctuating interest rates. There are more important redistribution effects of benefit from savers to borrowers. This means that if you are a net saver, then you will lose on your savings, however if you are a debtor, then the overall debt will be lower, this posed to be a great advantage to home buyers about 10 years ago as the value of their properties have most likely quadrupled in value. ...read more. Therefore at the beginning of the year certain economical indicators are agreed upon on the target of economic growth, and consumer spending. The government cure inflation levels by either reducing aggregate demand, or reducing aggregate supply. There are two popular ways of the government reducing aggregate demand, and they are either by tightening fiscal policies; which involves reducing government spending and/or increase taxation, which leads to reduced consumer spending. Alternatively the Bank of England can tighten monetary policies, which today means increasing interest rates. Interest rates are directly and inversely link to inflation rates, which means consumer spending will also decrease. There is also the possibility that through improving education, training and flexibility in trade and business developments, that production would become more efficient, thus reducing market prices and inflation in the long term. This is the method of reducing aggregate supply. Evidently high inflation rates can have both positive and negative results on traders and consumers. The process of change can in turn have either positive or negative effects on the economy. Hence it is the government, and the Bank of England's interest to control the fluctuating behaviour of inflation rates to maximise economic growth of the UK on a global scale. ...read more. This essay responds poorly to the question, but if this was a general overview of inflation it would have been good. 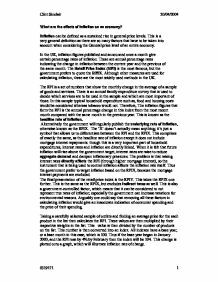 Inflation is defined well, yet there seems to be more focus on the causes of inflation, and policies to reduce it, rather than the effects. I cannot stress how important it is to answer the question, as it is a common mistake for students to just put down everything they know. Even if some of your work is relevant, you'll be penalised for going off focus! It is evident here that the costs have not been elaborated upon, which is a shame, as there's plenty of analysis that could've been done! The analysis here is sound. I really liked the introduction to inflation, albeit slightly lengthy, as it shows a really strong knowledge of why it is relevant. Giving a definition, showing how it is measured and what different types exist is always a good way to build the foundations to an essay on inflation. I was a bit worried to see "With continuous changes in the interest rates, time is initially lost, as consumers will shop around for the cheapest possible price of products." as this is completely irrelevant to effects of inflation. The discussion of "investors will not be willing to risk investing" is one that examiners like, but unfortunately this essay hasn't elaborated upon this point. I would be analysing how this will affect aggregate demand, with a diagram, and showing how it will impact the exchange rate and international competitiveness. It is this further analysis on the points given which will gain the top marks. Demand-pull and cost-push inflation are covered briefly, and I would've liked to have seen a diagram showing this. As this essay goes completely off the question, it is difficult to comment on the structure and the way it responds to the question. However, I did like the progression from knowledge to analysis as shown here. Sometimes words are capitalised when they shouldn't be, for example "the General price level". This isn't a drastic error, but it does show a lack of fluency and sophistication. Technical terms are used throughout, and it is easy to see these with the bolding in the first section. Spelling, punctuation and grammar are fine. Lower discretionary income again means lower consumer spending. For example if I was paying �200 a month for my mortgage and earned an income of �500 a month then my discretionary income would be �300. So if interest rates were risen it would mean my mortgage would also rise (unless I have a fixed rate mortgage). This theory is backed by much evidence including this from the US Department of Commerce As deflation is the opposite inflation it can be caused by the same factors. McAleese, D. (2004, p285) stated '...it can be caused by supply or demand shocks. Some protective policies such as tariff and quotas work by raising the price of imports and make the UK industries more competitive in the domestic market. Therefore, the firms may increase labour, and jobs for workers will be spared and expanded. This means that it is particularly volatile when a raw material that is universally used is increased in price. An example of this is oil as it is used in a wide range of industries. It can also affect the price of most goods in the economy as it causes the cost of transportation to increase. , recreation (15%) , 20% of their income on housing, water and fuel (10%) and food and non alcoholic drinks (10%). Health and education make up around 5% of a typical household spending. 2.) When choosing representative items for the basket a number of factors are taken into account. country in a given year, equal to total consumer, investment and government spending, plus the value of exports, minus the value of imports" (Webfinance, 2005). Increasing the money supply will increase GDP. Decreasing the money supply will decrease GDP. A positive growth in GDP is a major goal of economies. and continue to rise until the quantity demanded is just equal to the existing supply.